During the winter of 2017-18, the Bering Sea experienced the lowest sea ice coverage observed in at least 160 years. 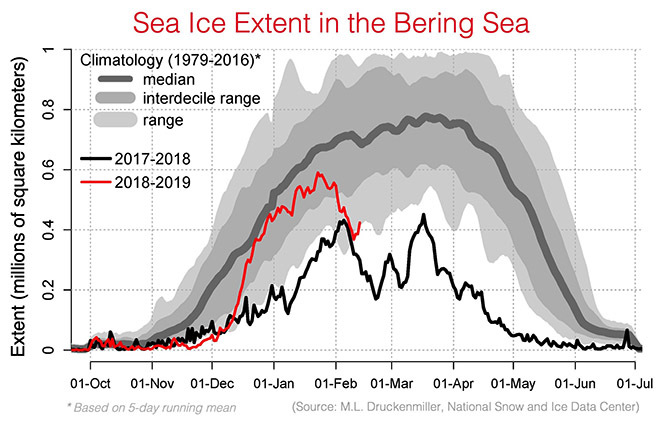 The combination of extremely reduced sea ice extent, little or absent protective ice along community coastlines, and winter storm activity caused substantial damage in several Bering Sea communities. The state and national media picked up on just how extraordinary conditions were. Scientists scrambled to put together short reports to raise awareness (e.g., this report from the University of Alaska Fairbanks), and the Alaska Regional NOAA branch quickly assembled a collection of briefing reports from over two dozen federal programs on what they were observing, intended to directly inform Alaska Native communities. A special session was held at the 2018 Fall Meeting of the American Geophysical Union (“Unprecedented Bering Sea Ice Extent and Impacts to Marine Ecosystems and Western Alaskan Communities”) and many related scientific papers are undoubtedly in the publication pipeline. The lack of sea ice cover was remarkable, but urgency is more evident when considering the connections to the daily lives of local communities and to their Bering Sea foodshed. The connections are many: less sea ice exposes communities to greater storm surge, increased coastal erosion, reduced hunting access to marine mammals, unstable conditions for on-ice travel by community members, etc. Such issues are critical motivations for the research community to gain a deeper understanding of how the “system” is changing, and many of the previously mentioned efforts are important contributions especially where local communities have established entry points into the research process. Yet, there is need for more local voices and new forms of collaboration, especially when unbounded to share outside the confines of a particular science program or project. More importantly, communities increasingly need to “use” the science and to insert it directly into their adaptation planning, emergency response protocols, and efforts to draw multi-level government and political attention to the challenges they face. The Bering Strait region is home to thousands of Inupiat and Yupik, who have lived in the region for millennia. For them, understanding their changing environment is critical to exercising tribal sovereignty. As a case in point: In spring of 2018, local community observations combined with satellite-observed conditions of weather and sea ice collectively documented poor walrus hunting conditions around several Bering Sea communities. Because the lack of hunting access was a substantial threat to local food security, the Eskimo Walrus Commission used this information to declare a food-scarcity disaster with the State of Alaska. Similar declarations in the past have resulted in large donations of fish to communities unable to harvest the number of walrus they require to feed themselves. Following last winter, the science community largely came to the consensus that the unprecedented conditions were the result of both the footprint of climate change and the rare convergence of particular environmental conditions, most notably sustained periods of south wind that pushed the fragmented ice northward throughout winter. The winter of 2017/18 was unique, but also in-line with what we might expect with Arctic amplification on a warming earth. Most scientists did not necessarily expect last year’s conditions to return this year. Yet, here we are in mid-February 2019 where Alaska is facing “strange days” of way-above normal temperatures and sea ice coverage in the Bering Sea that is now once again within the range of being historic (see figure below), if you ignore last year of course. A lot can change however during the last few months of winter; the increasing sub-seasonal variability is just another challenge faced by the region. The Indigenous Peoples of the Bering Sea region face a new normal: an environment that is unrecognizable in many ways. Yet, this is their backyard. We may be quick to think that “science is needed now more than ever”. Rather, this perspective needs to be flipped – “science needs to listen to communities now more than ever”. Research-community partnerships, informal learning networks, and channels for sharing knowledge need investment that puts community leaders more in the driver’s seat for steering research agendas increasingly toward the local realities of food security, emergency planning, human health and, ultimately, survival. Some of this requires the long-view—a generational investment in the institutions and infrastructure necessary for “knowledge co-production”, but for those on the frontlines of global change, they are starving now for new approaches to actionable science.